When your loved one needs help, the urge to jump in and take over can be strong. However, becoming a family caregiver is a huge responsibility, and it is important to carefully weigh your options so you do not become overwhelmed. While you discuss becoming a caregiver with your loved one, consider these 7 things before you make your decision. 1. Is Your Loved One Happy at Home? Make sure your loved one prefers to age in place, especially if he or she lives alone. Talk to your loved one about his or her options, and make sure remaining at home for as long as possible is the ultimate goal before you take on the role of family caregiver. 2. Do You Have Time to Manage More Responsibilities? You may already be juggling work, family, and social obligations. Look at your schedule and visualize what a day as a family caregiver will actually look like. Remember you can also utilize resources to make it work, such as hiring a professional caregiver. There are a variety of age-related health conditions that can make it more challenging for seniors to live independently. However, many of the challenges they face can be easier to manage if their families opt for professional home care. In Georgetown, SC, families can rely on expertly trained caregivers to keep their loved ones safe and comfortable while aging in place. 3. Are You Equipped to Help with Your Loved One’s Health Needs? Minor age-related issues or health requirements typically lead to a need for a family caregiver. Make sure you are physically and emotionally capable of meeting these needs. While you may have to learn more about specific health conditions, you also need to feel confident delivering care. 4. How Will You Handle Changing Situations? As a person ages, different things can alter a care plan. For example, a fall-related injury may mean your loved one requires additional assistance to continue living at home. Think about how you will handle such situations in the future before you commit to long-term care. Some seniors need occasional assistance at home, and oftentimes the family members who take care of them need time away to run errands, take a nap, go to work, or take a vacation. Georgetown, SC, respite home care experts from Home Care Assistance are available on an as-needed basis, giving your family peace of mind that your loved one will remain safe and comfortable while you relax or focus on other important responsibilities. 5. Will Your Loved One Accept Your Assistance? It is possible that your loved one may prefer another caregiver. If so, don’t take this personally. Your loved one may just be worried about being a burden on the family or concerned about having a family member helping with private activities such as personal hygiene care. Many families compromise by rotating tasks among caregivers according to a senior’s preference. 6. Do You Have a Strong Support Network in Place? A family caregiver should always have support, as he or she will probably lean on friends, family, and other caregivers for help. Talk to your spouse and siblings about how they can help you manage your loved one’s care. Have a plan for addressing schedule conflicts. 7. Are You Capable of Managing Stress? Caregiver burnout happens, but you don’t want to lose motivation while tending to your loved one. Make sure you have ways to ease your stress. Whether you hire a respite caregiver so you can attend a caregiver support group or step away for an hour to take care of your health, making stress relief a priority can help keep you motivated to care for your loved one. 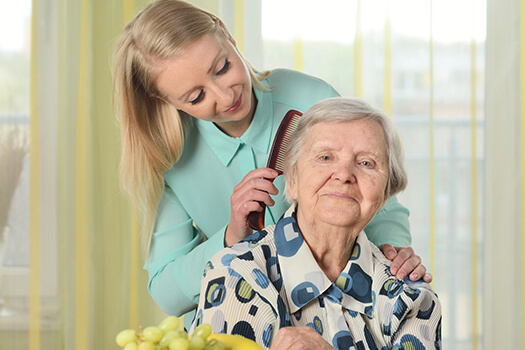 If your loved one has a serious medical condition such as Alzheimer’s disease, consider hiring a trained caregiver. Alzheimer’s can be challenging for seniors to manage without assistance, and it can be just as challenging for families who do not have experience in providing Alzheimer’s care. For trusted Georgetown Alzheimer’s home care, reach out to Home Care Assistance. Our proprietary Cognitive Therapeutics Method was designed to help seniors with Alzheimer’s and other memory-related conditions live happier and healthier lives. For more information on our senior care services, call one of our experienced Care Managers today at (843) 353-3105.